After months of waiting, Sonos's long promised Alexa-powered smart speaker has finally been announced. Called the Sonos One, the smart speaker integrates with Amazon's Alexa voice assistant via a dedicated Sonos Alexa skill. Interestingly, the company also announced that the speaker is also set to receive Google Assistant support later, in 2018. The voice control means you'll not only be able to control music playback, but you'll also be able to access all of Alexa's other functionality such as controlling your smart home and getting weather reports. 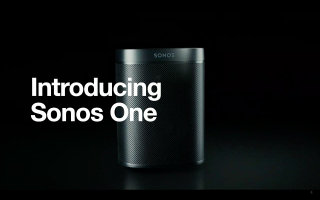 Since this is a Sonos speaker after all, it will also be able to integrate with any other Sonos equipment you have to get music playing throughout your home. You can pair two together to create stereo sound, add a Sonos Sub or integrate them with an existing Sonos-based home cinema setup. The speaker is based on Sonos's existing Play:1 which we were seriously impressed with when we reviewed it. The Sonos One features the same Class-D amplifiers and custom drivers. There are also touch controls on the device to control music playback directly. Other features include the ability to turn down the music when the Sonos One is listening to your voice commands through its six microphone array. AirPlay 2 will also be supported via a software update next year. To limit privacy concerns, the speaker has a light that's hard-wired to the microphone so that you can be sure it's not listening to you when you don't want it to. The speaker will be available in either black or white finishes when it goes on sale on October 24 for $199 (£199) with pre-orders starting today. In addition to the new speaker, Sonos has also announced that Alexa can be used to control its existing lineup of speakers. The Beta for this service starts today. Sonos first indicated it was working on an Alexa-powered speaker back in August 2016. A change to its privacy statement back in August 2017 indicated we'd see the smart speaker soon, before just one week ago pictures of the speaker appeared in the wild. We'll be interested to see how the speaker performs when we get it in for a full review. If Sonos can combine its excellent audio chops with the intelligence of Alexa it might have a great little speaker on its hands. Sonos isn't the only company to have recently announced a smart speaker, check out the full Amazon Echo range right here.